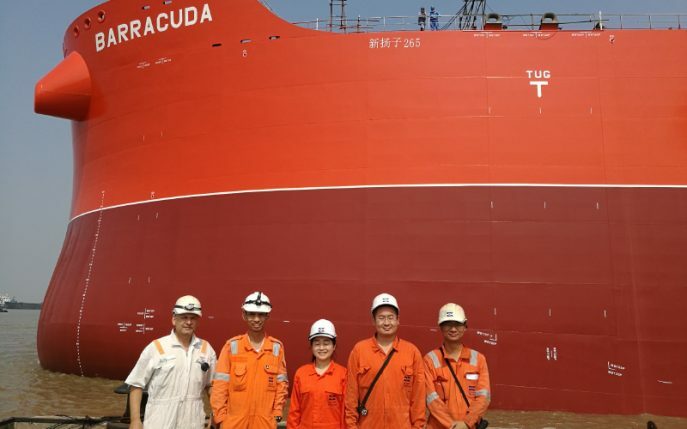 Klaveness Fleet Manager for Operations, Hans-Petter Olsen and the Company’s site-team could this week celebrate the launching of the second CLEANBU, MV Barracuda leaving the drydocks being shifted over to the outfitting berth. “Now we only have 7 more months to go, before the vessel is ready to join our existing fleet of combination carriers and make its contribution to our commitment to clean sea”, says Olsen. The vessel is being built by New Yangzi shipyard in the Jiangsu province in China. The next generation of combination carriers, the CLEANBU fleet will all get names of ocean creatures, to emphasize Klaveness efforts to protecting the oceans. These vessels have the same transport capacity as two vessels, a Kamsarmax bulk carrier and a LR1 tanker, and are of the most environmentally friendly designs you may find today in seaborne traffic. The barracuda is a salt-water, ray-finned fish known for its large size, fearsome appearance and ferocious behavior. The next generation of combination carriers have a unique design, representing the most climate-friendly solution around. In Klaveness Australia trade in 2017 the Company reduced the CO2 emissions from shipping with the equivalent of CO2 emissions from around 15 000 cars.